To show serenity, we automatically think of the countless sunrises and sunsets that have left us feeling serene. And this one would be the clear winner. We climbed strenuously uphill for a couple of hours. All the pain, all the hurt and all the weariness were zapped from us when we saw this sunrise over the French Pyrenees on the Camino de Santiago. This was only Day 1 of what was going to be the most amazing thing we ever did. Welcome your thoughts as always! This entry was posted in France and tagged Camino de Santiago, Camino Frances, Daily Post, Photography, postaday, serenity, sunrise, Travel, Way of St James. what would you order from our three-course taste of travel menu? Perfectly captures the theme! I absolutely love sunrises and sunsets and always try to watch as many as I can on my travels. One of those moments of being fully in the moment! The image says it all. Thanks Kat! You are sooooo right in saying that it was “being fully in the moment” – we certainly have learnt that is so important in living a fulfilling life 🙂 Hope you are having an amazing week. Thank you so much 🙂 Your kind words are what we need to hear on a Monday! Thank you! And to you, we wish you a Happy New Year!! Thank you for sharing your photo. I begin my Walking my Camino in about 100 days, I hope I am graced with good weather so that i can take the Napolean Route and get spectacular views like that. 🙂 Every day, we went to bed saying the weather will be good tomorrow and sure enough 40 out of 42 times, we got it right, so stay positive and enjoy the experience. We cannot wait to read all about it. It was the changes we needed in our lives! Buen Camino…. What lovely colors! The Camino de Santiago sounds like an incredible adventure. The Camino is one of the BEST (if not, the BEST) things we have done. 42 days of soul searching and walking and meeting people and just experiencing the beautiful countryside. We would do it again in a heart beat. One who returns from the Camino is never the same…. That is a really beautiful picture. I love the layers of colours and silhouettes. Thanks so much for your generous comment. It was just so majestic standing there and seeing this scene with our own eyes 🙂 We will never forget it! It was worth walking uphill for two hours to be rewarded with this glorious sight at the top. How lovely. It was the one of the most magical moments on the walk. Time literally stood still as we watched the sun make its way into the sky…. 😉 Witty comments always make us smile – thank you! Hi Jim! Thank you! We did make it to Santiago… after 42 days of walking back in October 🙂 It was the most amazing thing we ever did. Still dream of the experience to this day. It was an amazing experience that we want to do all over again. But next time, we would like to do the Portuguese way. Depending on when you go, we might see you along the way 🙂 Buen Camino! wow! Looks like something from a beautiful dream!!!!! Thanks Diana! It felt like a dream but the wonderful thing was that it wasn’t 🙂 Hope you have been well. Mani – we experienced the most incredible sunrises there, but this was probably one of all-time favourites! 🙂 Wishing you a wonderful weekend! It was our pleasure to be able to share one of our favourite sunrises! It really was a moment when we heard nothing, the sense of serenity! Such a wonderful picture…. 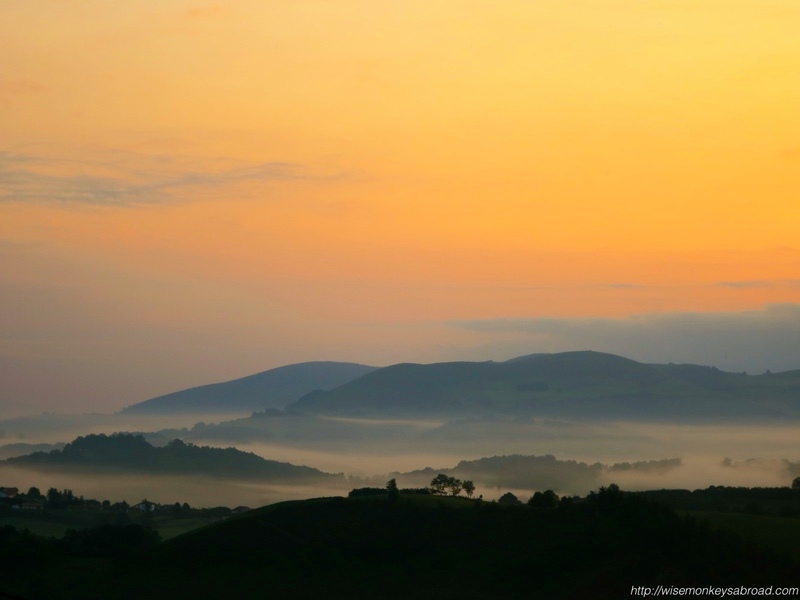 Even though there is a mist, I can clearly make out all the hills and curves and gradients…. This must have been one really amazing moment! Oh, thank you ever so much for your comment. The moment was one of many amazing moments for us 🙂 This photo is probably ranked as one of our personal favourites that we snapped on the Camino! Wishing you a wonderful weekend ahead. And Shikha – serene it was 🙂 Despite our huffing and puffing, the world seemed to have come to a complete stop. Nothing else mattered except the rising of the sun at that very moment. It sure makes you feel serene and I’d add “wow” to it! We are so touched and grateful for your comment! We couldn’t believe how our photo turned out but we really couldn’t go wrong when the scenery is that spectacular 🙂 Have a lovely weekend ahead. High 5 right back at you 🙂 Thanks for your sincerely lovely comment! Wow! 🙂 Worth the effort! Hey there Linda, It was definitely worth every step and every bead of sweat and muscle ache we endured 🙂 Hope you are well! Serene indeed! What a beautiful view! Thanking you 🙂 It was a view to remember!